Our home has a thick chain that hangs about 20 feet from our roof to the ground. Nothing fancy; it funnels water into a rocky planting area. The bulbs I planted there years ago thrive from the soaking rain or spring thaw. After the big snowfall at the end of February it was encased in crystalline ice. It glowed in the morning sun, then melted slow teardrops as the day warmed up. At first only a thin ice layer covered it. Colder temperatures froze the water before it reached the ground. 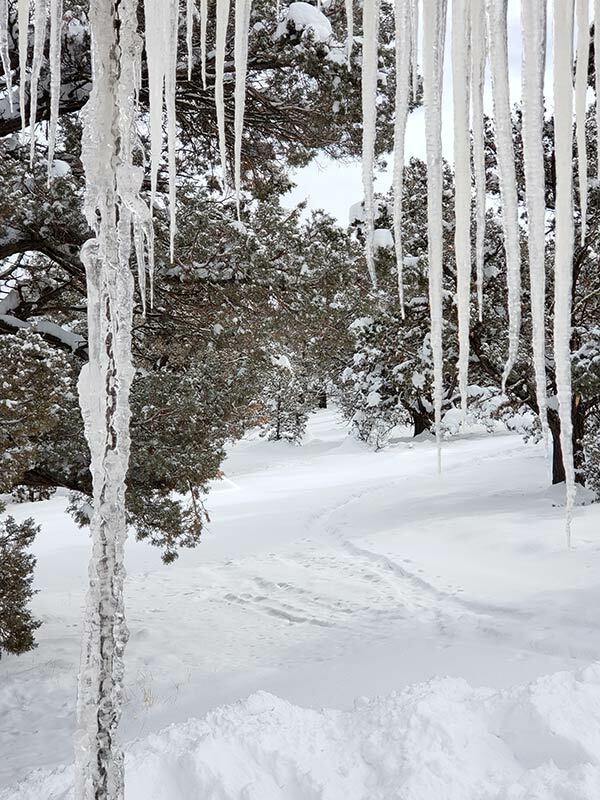 After several weeks of challenging temperatures and over three feet of snow, the chain held onto the water and created icy sculptures and icicles that defy gravity. Chains can mean a lot of things. Our country’s history of chaining slaves in hellish conditions creeps into my imagination and I cringe at the thought of what so many people went through. Chains are tools used to pull everything from logs behind draft horses, broken-down cars, and calves too big to come naturally. Chains encircle the ankles of “fancy” horses and hang around our necks as delicate illustrations of our wealth. Chains can hold dogs in tiny circles of suffering. One November, riding in the BLM, we found an emaciated border collie with a logging chain wired to his collar. He dragged it through the sagebrush and rocks until it caught on a bush and stopped his escape. We saw the worn path he’d made in the snow frantically trying to free himself. I see chains as a good example of the stories we hold from our past pain. The stories we use to explain who we are and why we feel the way we do can either benefit us or enslave us. Unlike the captives I mentioned, we have a choice. We can see chains as our strength and our deliverance or we can fall into circumstances where we allow them to keep us down and on a “very short leash.” We may not realize that we are making the same, rutted circles over and over again. We are tired at the end of the day, but we haven’t gone anywhere. I’m grateful for the chain that hangs next to our front door. Throughout the year, it reminds me of its value and its ability to hold beauty and nourishment. Soon the water sculptures hanging from the chain will melt away, leaving the naked, incredibly strong core. I’ve written about the chain and taken photographs of it so I remember all its incarnations. My journals serve a similar purpose. I can look back, remember and then decide which stories I tell. All that potential pain and power is a gift. Sometimes it’s heavy and feels too much to bear, but I’ve learned with perseverance and a clear focus, I can keep going. What chains are in your life? Are they holding you back or pulling you out of past stories? I invite you to take 15 minutes and write whatever comes into your mind on that topic. I’m often amazed at the words that flow from my pen or fingertips when I allow my creativity and imagination free rein. I’d love to hear what comes up for you.